"I began in my house in Manila in late August 2008. I wanted to create a second livelihood project that also reuses waste, while creating jobs in the process. Learning from lessons of my Jakarta XSProject, I wanted something simple and easy to replicate. The plan was to reach out to those who cannot leave home to work, and give them work to do at home. 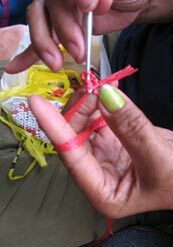 Inspired by senior eco-warrior and goddess, Ibu Bang Bang in Jakarta, who showed me how to crochet plastic bags, I asked the Filipinos I knew if any one knew how to crochet. All I got were blank stares, but it didn't matter: we started in my garage with a pile of colored wires from computers, used dry cleaner bags, and the supply of old plastic bags." There are 180+ mothers and grandmothers now. Among them they have over 500 children and an even more staggering number of grandchildren and step-grandchildren, most of whom have no regular income. Each week they trickle in, bringing their children and grandchildren along. As they settle down, we chat, joke around, share snacks, and then get to work. Stitch after stitch, they share ideas, encourage one another and learn. Before the internet and chat rooms, women would gather to work at hand crafts, including quilting, knitting, tatting, and lace-making. All of these arts are being lost. As a DESIGNER and MENTOR, I work with them one-on-one in helping them to develop their designs, do quality control, and suggest improvements (e.g. strengthening handles of bags, proper selection of colors and materials, and the like). We take in new products and finally pay those whose bags have been sold. They are all learning and earning: discovering their talents and developing their own sense of designs and color. Having little education, few opportunities and so many children, for many, this is their first experience in benefiting from their own talents and efforts.